Five Civil War Artillery Projectiles, c. 1861-65, a 10-pound Parrot shell with white-painted "ANTIETAM" near the top, an 8-in. 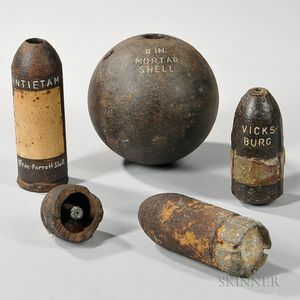 mortar shell, a top of an exploded shell, a Hotchkiss shell with "VICKS-/BURG" painted in white, and a 3-in. Dyer shell.